Excuse me for my English but I'm Belgian and I speak French. In hwinfo64 4.21-1963 Beta, I see the extent to CHL8318 probe is taken into account (I have a gtx 670) for VRM temperature. When I run the program, I'm all temperatures except those concerning the VRM temperature. Is this a bug in the program? Thank you. It's hard to say what the problem might be without further details - so please attach a screenshot of the sensors window showing those values. Additionally a Debug File including sensor data will be helpful for me to track the problem. Thank you for your quick response. Here's what you asked me, I must say that I do not have the original fan, I do not know if this may be down the cause. But the first time I started the program, I had the VRM temperatures and then I cut the program. Now, whenever I start the program, I miss these temperatures. It seems that HWiNFO doesn't find the CHL8318 chip anymore during the scan. Have you maybe changed anything in the computer configuration (GPU driver especially) or HWiNFO configuration between the two runs when you saw the CHL8318 values and didn't see them anymore ? Does that sensor maybe come back after a reboot or reinstalling the GPU driver ? Yes, I went nvidia drivers 314 320. I'll try uninstalling and reinstalling the drivers to see. Thanks. Thank you very much, you are a great, nay ... a giant . That was it, I cleanly uninstall the drivers and reinstall and it works. Again thank you for your help. Just one question - did you reinstall the same nVidia driver version, or did you went back to an older version? No, I put the same driver version (I had the 320 and I put the 320). I just did a clean uninstall the program manager and a registry cleaning + removal in hidden folders (not reinstall drivers from the nvidia panel as everyone does in general). I come back ... because the problem came back and without changing drivers. I noticed that the problem comes back every time you restart Windows. the problem is this, I puts the nvidia drivers, I again VRM temperatures. I restart the computer, I control and I do not have these temperatures. There must be a bug between the program and the nvidia drivers. I just take the test to change drivers. I put the old, the 314.22 to see if it was a problem with the new nvidia drivers (320). I had the VRM temperatures as usual and I shut down the computer. I raised and I started HWMonitor to see, but I did not have the VRM temperatures. The problem is well every shutdown. The program does not recognize the CHL8318 probe. This is interesting. So it works only after re-installing the nVidia drivers and after each reboot that VRM cannot be found ? Anyway, HWiNFO communicates with the VRM chip using those drivers, so I believe the problem must be there. Or, another theory might be that maybe the VBIOS somehow locks out the VRM during each boot and the driver install process enables it back. Yes, that's right. it works after re-installing the nvidia drivers but when I shut down the computer and I restart, I do not have values ​​VRM. I'm sorry, I don't have a solution for this now. It seems to be something quite specific and I think only nVidia knows the answer and they won't tell. Could you please check if any other tools (like GPU-Z for example) are able to report VRM values after reboot ? 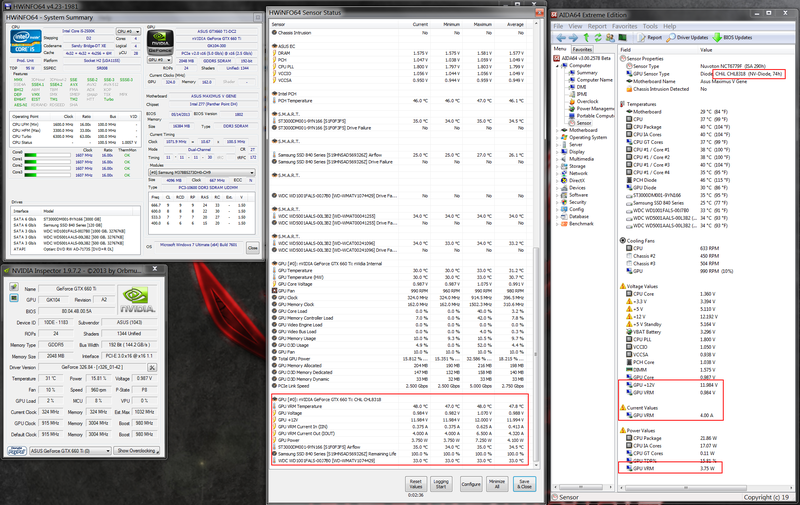 I do not have either the VRM temperatures with gpu-z or helped with 64. But Aida64, I have exactly the same problem. If I install the nvidia drivers, I CHL8318 the probe is known but to stop and restart the pc, the probe is no longer recognized as CHL8318. I have not tested with GPU-z new driver installation, but I guess there must be the same problem. I did another test. I made 5-6 reboot and then I'm the values ​​for the VRM. When I stop completely the computer, I have nothing more to start over VRM values​​. My pc is also suffering from the CHIL8318 going missing after cold restart with both hwinfo64 and aida64. It's there after I install the driver (first picture), it's even there after a restart, but if I use shutdown and then restart it's not detected anymore. This happens in all 320 series drivers I tried sofar, currently at v326.84. One of the more odd parts is hwinfo sensors displaying a blank were the CHIL should have been, just skipping some of the values, but also displaying some of them, like it did before in working state. (second picture) Not sure how it got the values there without the chil being detected? I understand there's probably something outside the monitoring programs causing it, but just wanted to report the odd stuff and would be pleased if you look at it again. I did post in the aida and geforce forums too, to try and solve it, but no luck yet. I'm afraid, this seems to be a problem of the ForceWare drivers and since HWiNFO (and other tools as well) relies on them, this would need to be fixed by nVidia. Other alternative would be to determine how to enable that CHL8318 device and do it explicitly, but this is also in hands of nVidia and they won't tell how to do this. As for the sensor values out of order, this happens because HWiNFO allows users to reconfigure the order of each value and remembers their actual position. Yes, such behavior is an issue and I'm planning to try to fix this. Currently you can press the "Restore Original Order" button in Sensors/Configure/Layout to fix it. It seems like installing the driver activates it, and that gets deactivated on a cold start, so I figured it should be a driver issue. Re-installing the same driver from the device manager without a restart fixes it again, so I'm sure it is the display driver component involved. Just restarting the driver by disable and then enable device did not have the desired effect, regrettably.